VANCOUVER, BC--(Marketwired - December 18, 2017) - Millrock Resources Inc. (TSX VENTURE: MRO) (OTCQX: MLRKF) ("Millrock") is pleased to report results from a stream sediment sampling program carried out on its Todd Creek project. The survey covered an area measuring 6 kilometers by 16 kilometers. 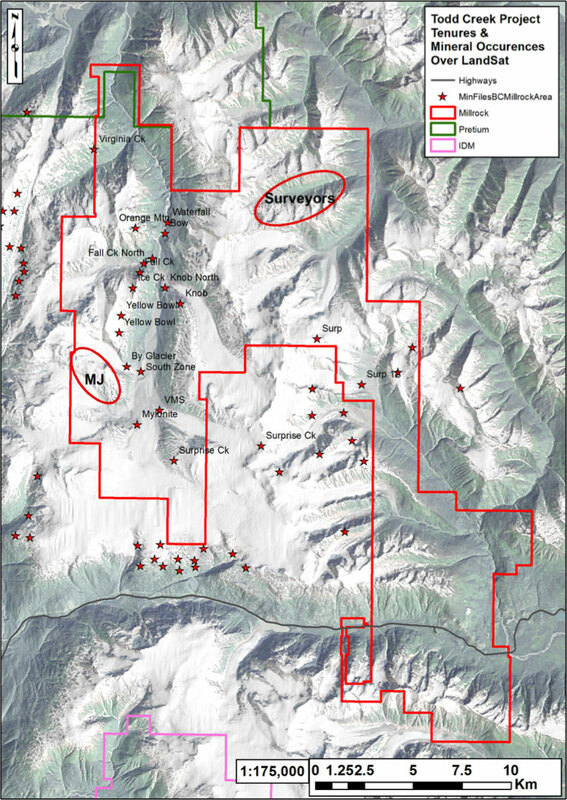 Multi-element anomalies were returned in areas of known base and precious metal mineralization which extend for 10 kilometers along the Todd Creek valley. The valley reflects a major faults system that appears to control and localize base and precious metal mineralization. The area around the previously documented Falls Creek, Orange Mountain and Yellow Bowl occurrences were found to be anomalous in gold, silver, copper, lead and zinc over an area measuring approximately 1.5 kilometers in diameter. Pathfinder elements of cadmium, barium, phosphorous and antimony were strong, and tellurium, a mineral frequently found in association with gold, was particularly anomalous in seven samples collected in a one kilometer diameter area. Additionally, two new prospect areas were also highlighted. These have been named Surveyor and MJ. The map included as Figure 1 shows the location of the Todd Creek property in relation to the adjacent claim blocks held by Pretivm and Seabridge, upon which are situated the Brucejack high grade gold mine and the KSM porphyry copper-gold deposit, respectively. Figure 2 shows the new anomalous areas, and other surface mineral occurrences that had been documented by prior workers. The Surveyor area is anomalous in gold, silver, copper, molybdenum, lead, zinc, and pathfinder elements cadmium, antimony, tungsten, sulfur and phosphorous. Of particular note is strong nickel anomalism. The area is primarily underlain by Lower to Middle Jurassic volcanic and rocks of the Hazelton Group, a stratigraphic level known to be productive for mineral deposits in the Golden Triangle District. Previously in 2011 geophysical surveys were compiled and processed by an earlier property owner. A Versatile Time Domain Electro Magnetics ("VTEM") survey and magnetic survey were examined. Several conductive zones with a strong magnetic disruption response were noted in the vicinity of the Surveyor geochemical anomaly, and are potentially indicative of porphyry-style mineralization. These coincident VTEM, mag and multi-element stream sediment anomalies that comprise the Surveyor prospect will be a priority for follow up in 2018. The second new area of interest identified by the stream sediment program has been named MJ and is anomalous in gold, copper, molybdenum, lead, zinc, and pathfinder elements barium, germanium, tellurium, tungsten, uranium, and niobium. Geophysical surveys also indicate possible porphyry style mineralization. Millrock consultants familiar with historic work on the Todd Creek project report that this valley was filled with snow and ice in 2008, the last time which exploration crews were active on this project. This portion of the project is largely covered by the Todd Icefield. The MJ area will also be a high priority for follow up in 2018. A total of 238 stream sediment samples was collected in the 2017 program. The sampling work was done under contract by Equity Exploration Consultants Limited ("Equity") in September, 2017. The following table summarizes the results. 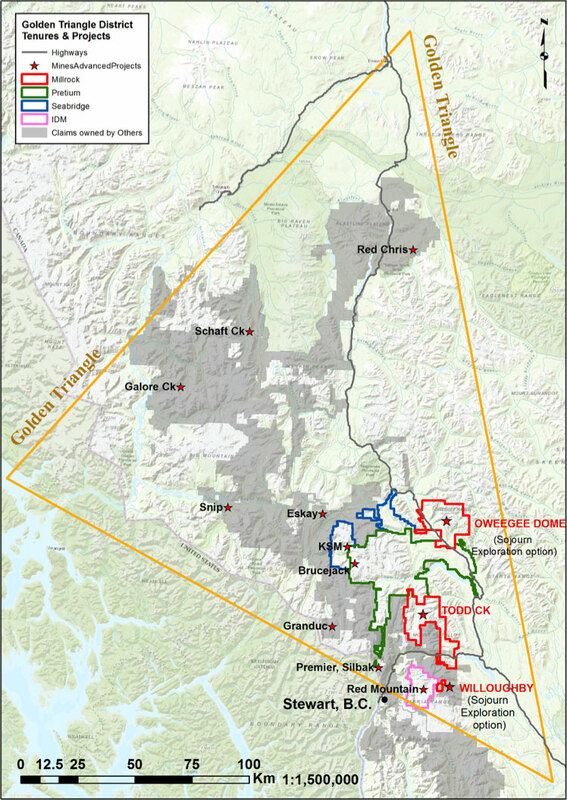 The Todd Creek project is favourably situated about 30 kilometers southeast of the high-grade Brucejack gold mine and 30 kilometers northeast of the town of Stewart. Highway 37A passes through the property. The property is prospective for precious-metals-enriched polymetallic volcanogenic massive sulfide deposits and porphyry copper-gold deposits. There are numerous, known occurrences and small deposits documented on the property and large alteration zones indicating significant mineralizing systems. The Todd Creek project is described in more detail on Millrock's website at this link. Millrock adheres to stringent Quality Assurance - Quality Control (QA/QC) standards. All samples were collected by Equity Engineering Consultants Ltd. ("Equity") personnel under contract to Millrock and securely stored until delivery to the ALS Minerals prep lab in Terrace, British Columbia. After preparation the samples were sent for analysis at the ALS Minerals Ltd. North Vancouver, BC laboratory, a 17025:2005 certified facility. Equity implemented a QA/QC program utilizing duplicate sampling and blanks at an average rate of one duplicate or blank per 15 samples. No QA/QC anomalies were noted in the analyses. All results from blanks, standards and duplicates were reviewed and found to be accurate within acceptable tolerances for results obtained to date. Millrock Resources Inc. is a premier project generator to the mining industry. Millrock identifies, packages and operates large-scale projects for joint venture, thereby exposing its shareholders to the benefits of mineral discovery without the usual financial risk taken on by most exploration companies. The company is active in Alaska, British Columbia, the southwest USA and Sonora State, Mexico. Funding for drilling at Millrock's exploration projects is primarily provided by its joint venture partners. Business partners of Millrock have included some of the leading names in the mining industry: Centerra Gold, First Quantum, Teck, Kinross, Vale, Inmet, Altius, and Riverside. Millrock is a major shareholder of junior explorers PolarX Limited. and Sojourn Exploration Inc.